Above all else though, Dean was a multifaceted, multi-talented, complex personality who could have become many things. It was only through a specific combination of talent and ability, desire and focus, and hard work and happenstance that he became a timeless icon and one of the most famous figures in American pop culture. Dean grew up in Fairmount, Indiana, a small town that stakes claim to being the birthplace of both the hamburger and the ice cream cone, as well as the ancestral home of Wilbur and Orville Wright, inventors of the airplane. After moving to New York, Dean's first "big break" was in the 1952 Broadway show See the Jaguar, which opened and closed in only four days. While living in New York, Dean's struggling actor friends and contemporaries included the then equally unknown Martin Landau, Paul Newman, and Steve McQueen, all of whom Dean competed with at casting calls. 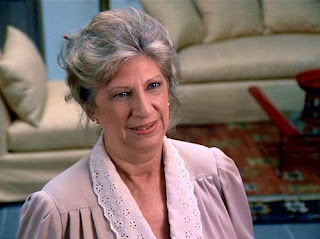 Also while living in New York, Dean shared an apartment with his good friend Dizzy Sheridan, best known for her role as Jerry's mother on the sitcom Seinfeld. 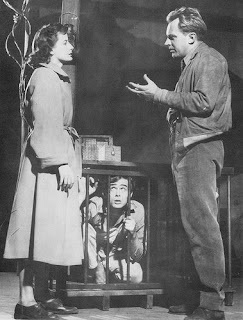 Dean had starring roles in only three films, each time portraying a character that (like him) had one syllable in both their first and last names -- "Cal Trask" in East of Eden, "Jim Stark" in Rebel Without a Cause and "Jett Rink" in Giant. 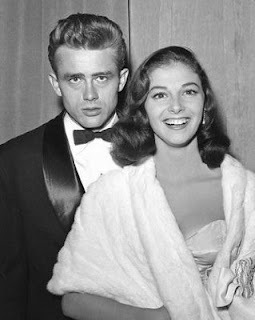 In the early 50s, Dean dated and fell in love with Pier Angeli, an Italian actress he met on the set of East of Eden. Angeli eventually wound up marrying singer Vic Damone, and on the day of their wedding, a dismayed Dean sat outside the church on his motorcycle and gunned the engine as the bride and groom emerged. Years later, Angeli confessed that Dean was the only man she ever really loved. Dean had a premature "aged" look when he died. For the movie Giant, he had shaved his head to create a receding hairline look for his scenes as the older Jett Rink. Foreshadowing Dean's tragic death, in the original script for Rebel Without a Cause, when Jim Stark runs out of the house to show that he removed the bullets from Plato's gun, the police shoot and kill him. 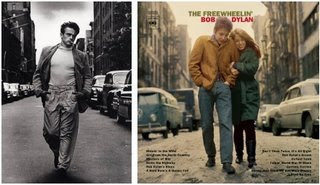 The cover art of the album The Freewheelin' Bob Dylan, purposelly recreates the setting and pose of this famous photograph of Dean. Finally, here's a 20/20 news story from many years ago that does a nice job of recounting Dean's life and legacy. Why have you deleted my comment? 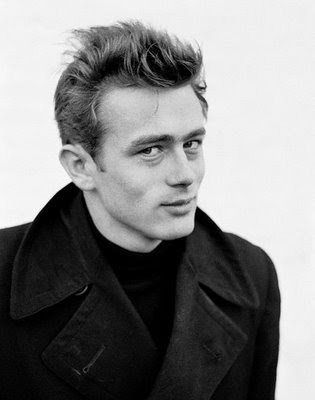 Where did you find that poem by James Dean? No one deleted your comment. The James Dean poem is reprinted in the book James Dean: The Mutant King by David Dalton. Commercials We Love - "You Will"